Wow! That's a lot of information in picture form up there! LOL! BUT, it is ALL TRUE! Today we have a new challenge for you AND an awesome blog hop featuring the brand new STAMPtember® products from Simon Says Stamp! The challenge this week is STAMP IT! We want to see you using stamps on your project! If you came here from Jenn's blog you are already well on your way! 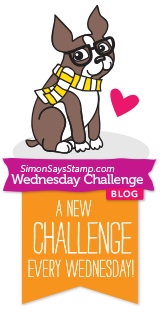 If not, you may want to jump back to the Simon Says Stamp Wednesday Challenge blog to begin at the beginning! For my card today, I used the absolutely GORGEOUS new Ornaments stamp set! It even has coordinating dies to go with it! My sentiment comes from the Inside Holiday Greetings stamp set, with which I am in love. For reals, though. It's pretty darned fabulous. Like, lots. There are actually LOTS of awesome sentiment sets in this STAMPtember® release. I may or may not have ordered a couple more of them. Because I may or may not LOVE THEM SUPER DUPER TONS OF LOTS. For reals, though. I do. I embossed the ornaments using some fabulous tinsel embossing enamels from Stampendous. I love how these capture the detail of the images even though they have super fabulous chunks of glitter in them! YAY! AND...it's heat embossed, so NO glitter mess! Personally, I think glitter messes are kind of fun, but apparently I am alone on that one. HA! NOW, here's the deal, be sure to visit the Simon Says Stamp Wednesday Challenge blog for lots of inspiration and to link up your STAMP It! Challenge card! You could win a $50 voucher to the Simon Says Stamp Store! Now hop on over to Jo's amazing blog full of inspiration for the next stop on the hop! You can find the complete list below! Perfect way of showcasing these beautiful new ornament stamps! Gorgeous card! I love your design and the baubles look so pretty with all the sparkle and the twine bows! Love the glittery ornaments on your card! Wow, I did not know there is an embossing powder with glitter in it! Looks fabulous! LOVE this! The "Ornaments" stamps and dies were my favorites of the whole release! Great card and great glitter! And the sparkle is perfect for those ornaments! Gorgeous card Jennifer :-) I love the glittery baubles, I also believe you can't ever have too much glitter ,,, love it ! Great card - love the ornaments and the clean look. Very cute card love the ornaments. I am loving the colors you used on this card... also am loving that one particular mosaic ornament. I use a lot of chunky glitter. The texture is awesome! Thank you! I just love you're ornament card. A beautiful set of dies and I love how you glittered them. Looks so lovely with the plain bows and the beautiful sentiment. I love them and have that set on my wishlist. Gorgeous card Jennifer! Lovin' all the glitter!! just beautiful!!! Love the ornaments…love your colour choice! What card doesn't need a little glitter? Like how you heat embossed the ornaments for glitter shine. Love the sparkle and texture on your ornaments! So pretty! I love those glittery ornaments, I think we all need a little glitter in our lives! Love the ornaments, the glitter, the twine, everything. :-) Thanks for sharing!! 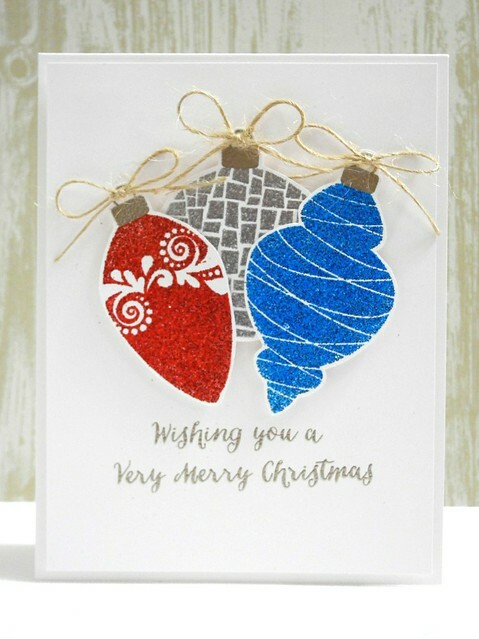 wonderful sparkly ornaments on your lovely card! Love that you made the ornaments sparkle! Simple but gorgeous! Thanks for sharing!! This ornaments just shine. Love them. What a fabulous glittery card! I love that ornament stamp and die set too! A must have for sure! A gorgeous card Jennifer, your sparkling ornaments are stunning!!! Such a beautiful CAS holiday card! The twine bows on the ornaments are just perfect! Can't wait to get this amazing stamp set! cute Christmas card.. Love those ornaments.. Such beautifully heat embossed ornaments!! Gorgeous Christmas card!! And those hemp/twine bows are so AWESOME!! SUPER sweet card, Jen. Thanks for being part of the hop, and for sharing your talents to help inspire us all. I absolutely LOVE me some SSS and I'm enjoying the HOP! I love the silver sentiment! Wow those glittery ornaments look fabulous!! What a sparkly beauty you have created! Very beautiful card...love the sparkle!! Beautiful card. Love the sparkle! This is a beauty. I'll have to look into that embossing tinsel. Yum! Love your cool, crisp card! Love the glitter on the ornaments! This is a STUNNER!!! Love the glitter! These glittery ornaments look wonderful! These are beautiful, sparkly ornaments! I can see why you may love them! Gotta check out those sentiments! Pretty ornaments, and I love how you've layered them and tied the twine to the tops! So pretty! Love all the sparkle and glitter. Lovely cards. I really like your card. I have never seen that tinsel embossing enamel and it is amazing the texture you get while preserving the details. And by BTW I wear my glitter with pride and also think it is fun. Unless itt gets in my eye. Then... not so much. The sparkly embossing is great! wow! Those sparkly ornaments really POP right off the page! So sweet. So simple. One of my favorites. I am in love with these ornament dies, great cards! Love the glitter with the twine! Lovely! totally love this card and the glittery goodness! OMG!! Love how you combined all the glittery ornament stamps into one fabulous card!! Love your fun glittery holiday card! Love this stamp set and your card is fabulous! Lots of folks have use the ornaments, but never mixed them up like you. You can never go wrong with a lil sparkle! Very pretty!! This inspires me to do more with glitter/embossing. Beautiful card! I really like those ornaments! I love this card -- I think it is one of my favorite on the blog. The sentiment is great and the ornaments have just the right amount of sparkle! Beautiful creation here today Jenn. Love the texture of this card, but what stands out is the elegant and classy feel that these bulbs give. Reminds me of those glass bulbs of days gone by, ones my Mom had on her tree. Pretty to look at but not to touch because they were so dainty and elegant all at once. Lol. Love the crispness and clean approach to this card as well. Thanks for sharing sweetie. Yes those stamps are the cutest love your card. Thanks for sharing. What a fabulous bauble card love how the baubles sparkle. Love your CAS and elegant design. And the glittered baubles look great! This is gorgeous! Love those beautifully coloured ornaments! Beautiful card. I love those gorgeous glittery ornaments. I ordered that stamp, and now I can't wait to get it! Your card is beautiful! Gorgeous ornaments! I love all the white space around them; it truly allows them to SHINE! I love the sparkle embossing on your card. Very nice! Love these sparkly ornaments, great colours too! I love glitter in any form, loose or embosing and this is beautiful card. Love those ornaments! The embossing powder is perfect! Beautiful festive fun! You've showcased this set perfectly! Love the sparkle. The mosaic look is great and the font on the sentiment is lovely. Thanks for sharing. This is terrific! Love the sparkly ornaments. very cute! I love to see the ideas that everyone has! so gorgeous CAS - WOW! I love sparkle messes too! Great card. I really need to get started on mine. This is a beautiful sparkly card! Such a beautiful card. I love these sparkly ornaments and the sentiment embossed in silver is perfect to go with them. Very pretty card. I love those ornament stamps! Pretty card! It shows you had fun creating these cards... great new products to try! What a gorgeous card, I love all of the ornaments and beautiful sparkle! Cute layering of the ornaments! Your card seems so full of joy. I like this ornament set. Great job. I love your beautiful sparkly baubles and the CAS style! Love this new set of ornaments and you've used them beautifully! Did you say "Glitter"!?!? You got me right then and there as I love anything that sparkles... even the cat! Seriously, you card is lovely, clean and simple. Did you say "Glitter?". You hooked me right then and there. Your card is absolutely stunning, yet clean and simple. LOVE it! So much excitement for stamptember I love all the new creations that are everywhere right now !! Makes me so happy , love your work happy stamptember!! So very pretty and sparkly! I'm definitely inspired! Thanks so much for sharing! So pretty and shinnnnnyyy lol. Lovely CAS design. Very elegant. Love the dimension the embossing glitter gives the card. wonderful Ornaments stamp set. Love the colors and style. TFS. A great and sparkly card! Gorgeous card! Love those ornaments. You are not alone in thinking glitter messes are fun. I love glitter and you made some stunning ornaments. What a fun way to show off those gorgeous die cuts. wonderful color combo on your card! I LOVE this card Jennifer - the twine on the baubles looks fantastic! These glittery ornaments are wonderful! Glitter is always a good idea for Christmas cards, really pretty! Jennifer, these ornaments are gorgeous - so glittery! I want to hang them on my tree! That tinsel enamel embossing is amazing! Love how you used it. Nice CAS card! 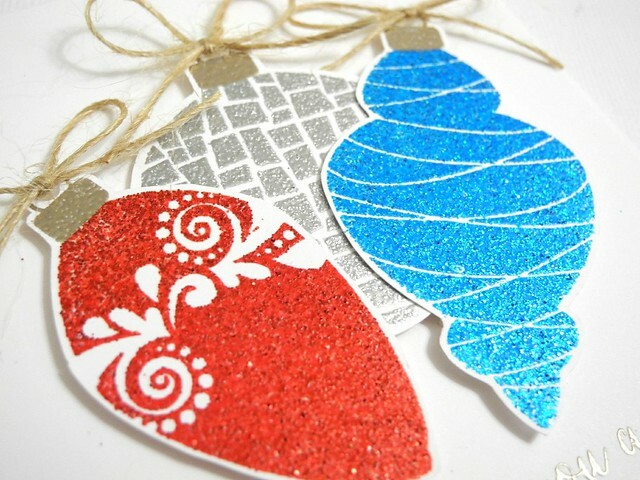 Love the glittery embossing on the ornaments set against the white background. I don't mind glitter mess myself, especially since getting the tip from Jennifer McGuire about using Swiffer dusting cloths to clean up--works perfectly! Thanks so much for sharing your awesome card! Thanks for the new idea for christmas ornament stamps! Def need that tinsel embossing powder! The blue is electric! Your great cards always make me smile from ear to ear, Jingle. Thanks for sharing your lovely work. I look forward to seeing everyone's great projects. Such a fun blog hop! This is so pretty love the little bows! Super cute card...... I love those glittery ornaments and I'm so not a glitter girl. Gorgeous sparkly goodness! Fabulous card. This was a great hop! LOVE your sparkly ornaments and VERY MERRY silver sentiment!!! THANK YOU for sharing your CREATIVE Christmas INSPIRATION!!! So pretty love the sparkle! The chunky glitter gives it such texture, but I do like that it's "sealed" in the embossing powder. Pretty card! I love the glittery ornaments, thanks for sharing. Such a pretty card. Love those big ornaments.